The Rangers don't start until tomorrow, but today is still baseball's Opening Day. The world is right again. One of the people who took me up on my free book challenge liked Chasing Filthy Lucre and gone and told a bunch of people about it. Thanks, Aden Penn. Not only did she post a review of the book at Smashwords and Amazon, she submitted a review to the site pinkraygun.com. Here's an excerpt. You can read the full thing here. This little novella is how I like my science fiction stories. Less shiny spaceships, and more dystopian grit. It opens up with a great action scene that is well paced and draws you right in. How do you get my book? I've had a couple of people ask exactly how to get Chasing Filthy Lucre, so here's a quick tutorial. There are a few ways, actually. First, if you have a Kindle or a Nook just go to whatever online store feeds you ereader. Search for my name there and you should find me. If you have one of the other ereaders then go to Smashwords.com and search for me there. You can download your preferred file format there and load it onto your ereader. If you don't have an ereader already then you can get one of the ereader apps. Pick either Amazon or Nook and go to the proper site and download an app that you can run on your computer desktop or on your smart phone. Don't think you'll like reading on your phone? It's really not bad. I tried it out first before my family bought me a Kindle for Christmas. Wasn't sure I'd like reading on a small screen, but it's a reading experience that is easy to get used to. Once you choose your reader, go to the proper site and search for my name. The site should automatically deliver the book to your reading app. Now you're thinking, "That's nice, Jarrett, but, man, it's a lot of work." Granted, it is. One time work, but it's not just an easy one or two steps. If you don't want any ereader app then you can go to Smashwords and download one of their files that doesn't require and ereader to open. There is a PDF file, and RTF file that can be opened on most work processors, and a plain text file. All of those files should be something you can open. So there you go. Where and how to get Chasing Filthy Lucre. No more excuses. Ask Gina. I need help. This writing thing is something that I have wanted to do forever. Forever and ever and ever. I've been writing since I was a kid. Literally. Like elementary school. Well, maybe junior high. Still, I was young. But another thing I've also done since I was a kid was be painfully shy. I know I shouldn't, but I've always cared about what others thought of me. Not all others, just others that I know and will have to interact with on a regular basis. That's why the writing thing was something I did in a deep, dark cave where the only light was the little that came from the screen of my laptop. I didn't want anyone I knew to know I did it. It's not that I thought what I wrote was bad, I just didn't want anyone to have a chance to judge my writing, and by extension, judge me. I'm slowly getting over that, because I have to. If I want to sell any of these books, the first people I had to ask were friends and family. So I did. I swallowed my pride and posted links to it on my personal Facebook page. And I got some good reaction. People seemed eager to read it. That's great, but their friends and family. I'd hope they wanted to support me. I also sent out daily promos on Twitter. Got some good reaction there. That was nice. A real ego boost. But here's the deal. I feel a bit like I've tapped those markets. Anyone who sees me regularly on Facebook or Twitter and was interested in buying my book has likely already bought it. So what I need to do now is get more people to read the book. I need to get it in front of their eyes and let them know about it. Give them the opportunity to buy the book. So, now I have to figure out a way to do that. I think I have an idea, and here it is. I'm going to give away ten copies of the book to the first ten folks who leave a comment here and say they're willing to do one thing for me. If those people say they'll be willing to read the book -- it's only 21,000 words, shouldn't take too long -- and then, if they like it, tell someone about it, those people will get a coupon code for a free copy. And if they're willing to buy a copy then that's fine too. Links are up top in the "Where to read me" tab. Now, telling someone may mean just telling people you know who may like the book. It could mean leaving a review at Smashwords, Amazon, or Barnes and Noble. It could mean telling people about it on your blog or a message board. But tell someone. 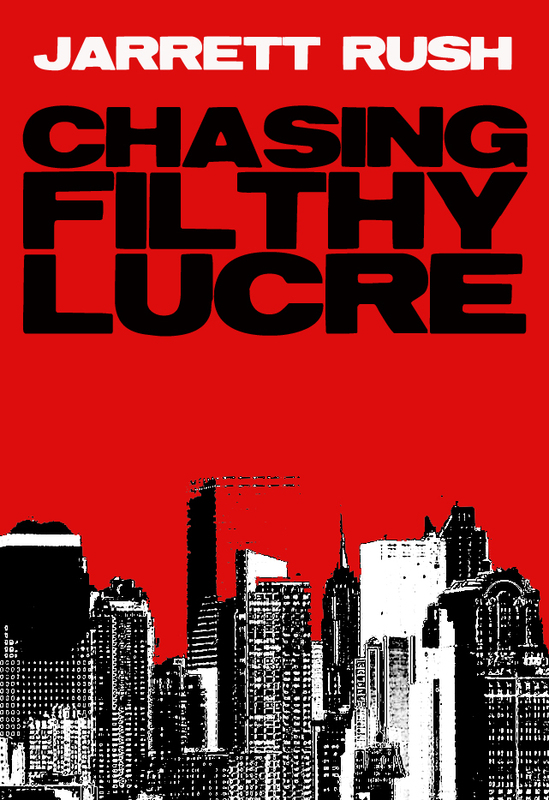 I need to start building word-of-mouth buzz about Chasing Filthy Lucre and the only way to do that is to get people talking about it. Are you willing to do that? If so, leave your email address in the comments or send me a message at jarrettrush@yahoo.com. It's in the New York Times. Amanda Hocking has signed a deal with St. Martin's to publish her next series. Apparently the bidding for it passed the $2 million mark. Good for her. I can't imagine there are too many people on the indie path who would turn down money like that. They attribute it to her blog. Read the whole post here. "I can’t tell you how many people I’ve heard saying, “But paper isn’t going to disappear.” That isn’t the point! If you ask the wrong question, the right answer to that question isn’t going to help you. So the question isn’t, “Will paper disappear?” Of course it won’t, but that’s not what matters. What matters is that paper is being marginalized. Did firearms eliminate the bow and arrow? No--some enthusiasts still hunt with a bow. Did the automobile eliminate the horse and buggy? No -- I can still get a buggy ride around Central Park if I want." Barry Eisler at Joe Konrath's blog in a conversation on Eisler's decision to self-publish his next novel. It's a long back and forth between the two but worth a read. So my first full week as an indie author, the week my novella is available for sale at Amazon and Barnes and Noble as well as Smashwords, is also the week that Barry Eisler makes his announcement that he's saying no to a $500k deal from a traditional publisher and is going to self-publish his next novel. A huge turning point, right? A best-selling author saying that this indie thing may not be such a crazy venture afterall. Hooray! Validation! Except this week was also the week we learned about Amanda Hocking, indie publishing's uber-successful poster girl, and the seven-figure bidding war between traditional publishers to sign her up. Oh, no. The indie standard-bearer ditching the indie life and going traditional. Failure! Un-validation! All of this has me thinking a couple things. First, I think it's great for both of them. Both moves make a lot of financial sense for each. Eisler has a base of fans already built. Indie success should come easily. I doubt any of them are going to care whether his next book came from a traditional publisher or not. They just care whether or not they can get a copy. He can get the book in their hands faster and keep more of the money for himself. And for Amanda, it's a seven-figure deal. That's crazy money. But the bigger thing I was thinking was, "Who cares?" I mean, really. I think both stories paint a very interesting picture of where the publishing world is right now. But who cares how someone publishes? We all make our choices. Decide what path is best for us and then pick up our bags and start walking down it. I made the decision that I was going to give the indie thing a shot. I don't feel better or worse about that decision because of Barry Eisler or Amanda Hocking. I also don't feel like Eisler is some kind of better guy now because he's trying the same thing I am. And I don't feel like Amanda is a worse person for attracting the kind of attention she has from the traditional publishing world. But the reaction of some folks, especially to Eisler's announcement, was one of vindication. And, really, who cares? Walk your path. Walk it as straight as you can, no matter what your final destination is. 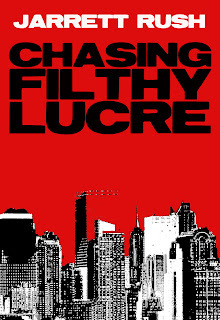 Chasing Filthy Lucre should be available at Amazon and Barnes and Noble some time today. And if not today, then some time this weekend. It's been available at Smashwords for a week now. That means that this dream I've had for a long time, this dream of becoming an author, isn't a dream anymore. It's real now. I have a book for sale. It's weird to me to say that. Weird, but exciting. I like my story. I think it's good. I'm hoping readers agree with me. As much work as it was to write and edit the book, the real work starts now. I have to market this thing. I have to let people know it's available. I have to try and get it reviewed. I need to find where my potential readers are hanging out and talk to them there. I need to see if there are any bloggers who might let me hijack their blogs for a day. And speaking of blogs, this place is going to have to change too. What I write here can do as much to sell me to potential readers as anything else. No more rambling on about book progress all the time. Now I need to offer real content on a regular basis. It's something I've been trying to do lately, although I haven't been so successful. It'll all be hard work, but I knew that going in. And it would be tough work if I were traditionally published instead of trying to do this myself. I'm ready, though. Ready to make this work. I have some sales goals that I'm aiming for. I'll keep those to myself. I don't know whether or not I'll share sales numbers specifically. We'll see what I do when the time comes. For right now, though, I'm just waiting on Amazon and Barnes and Noble to finish processing the book so it can be made available to the general public. Because now, this dream is real. I'm reading Zoe Winter's book on being an indie author. It's great, by the way. Written well. Very conversational. It's like you are sitting in a room with her and she's just telling you how she's made a go of it. Right now I'm on the chapter about cover design. She's talking about hiring a cover artist. She says it's not a necessity that someone be hired to do your book cover, but it's nice if you can afford it. I agree. It'd be nice to get a professional to do it for me, but I don't have the few hundred dollars it would cost. That means I'm doing it myself. I've worked up something I like but wanted to see if I could get others' take on it. I was going for something bold and eye catching. I also wanted to get across the roughness of and grittiness of the story. So, others, tell me what you think. Did I succeed? "Traditional publishing and indie publishing aren't all that different, and I don't think people realize that. Some books and authors are best sellers, but most aren't. It may be easier to self-publish than it is to traditionally publish, but in all honesty, it's harder to be a best seller self-publishing than it is with a house." Amanda Hocking at her blog. The Girl's seal of approval. Gina has been reading Chasing Filthy Lucre the last few nights. She's going to be the last set of eyes on it before it makes its way into the wide, wide world. Having her say she likes it is something that's very important to me. As long as she thinks it's good, then I'm happy. I hope other readers like it. Hope they love it. But as long as Gina thinks it's good then I can live with whatever reaction I get from the public. So, yes, I write so I can impress the girl in the end. Sue me. Anyway, last night she's reading the last few pages. I know where she's at and what's coming up and I'm watching to get her reaction. I want to see if she's surprised in the place I want her to be surprised. She's reading. I'm watching. Then her eyes get a little wider, her mouth opens in surprise and she says "What?" Perfect. Exactly what I was looking for. I can't tell you how satisfying it felt to see that what I wrote had the exact reaction I was wanting it to have, not only for her but, potentially, for other readers too. 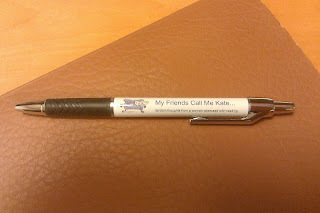 On January 19 I posted a little thing sending everyone toward Sabrina Ogden's blog, My Friend's Call Me Kate, where she had posted a guest post I'd written for her. It was all about why I write. And since that time, that post has become the most popular ever on my blog. It's the one that's been visited the most. I can't explain it. I have no clue why so many people are finding that blog post. Sabrina sent me a message on Twitter saying she'd send me a little thank-you gift for being a guest poster. It arrived in the mail a few days ago. Here it is sitting on top of my idea notebook that I always take with me to the day job. Thanks, Sabrina. 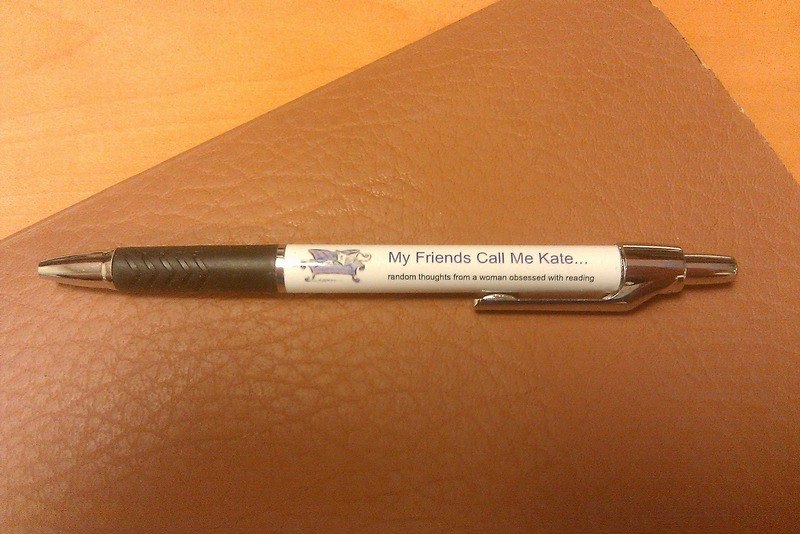 A pen is always appreciated. Wanted to share a few things that I've found and I like. This may become a regular Friday staple. May not. Guess we'll see next Friday. I stumbled across this band on the Internet. I was listening to an online radio station and the song in the first video below came on. I loved it. Musically, I'm pretty open. I'll give just about anything a chance. But there are a couple of things that are automatics for me. A horn section and an organ. If a song has either of those there's a very good chance I'm going to like it. If it's got both, forget about it. Well that song has the organ. I checked out the rest of the songs through the band's web site and you tube. The rest of the songs from that album were just as good. I listened to them over and over again at the day job. Gina eventually bought me the CD for Christmas that year.There is something about that singers voice. The impurities in it or something. It's just a unique sound. She bought me the band's next album this year for Christmas. I think I might like this one better. Favorite song off it is the one below. This album has much more of a country feel to it. There's slide guitar and some fiddle. But, if you're worried, they aren't going to be playing it on your country radio station. The recording quality on those videos isn't the best, so if you like what you hear go search them out and look for the real videos. The official videos are what I wanted to embed here, but that functioning was disabled. I started reading this short story while in the waiting room at the doctor's office. As I got farther into it I kept finding myself hoping that the call back to the exam room would be delayed. I wanted to finish this story. I got my wish. On the drive to work I was still thinking about the story. It's a taut tale, with nothing wasted. Lots of action. It's a great introduction to Merz's character Lawson -- who, I think, can be best described as a vampire cop. I'd never read any of Merz's series, but that didn't matter here. He does a great job of placing the new reader into his world without wasting time or words. The thing that I liked best -- and, after reading the beginning of the first Lawson book, a strength of Merz's as a writer -- is the dialogue. There is a natural feel to it. These are genuine exchanges, something that's not easy to write. So check it out. 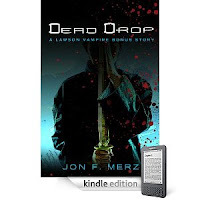 The story is free and includes an excerpt of the latest Lawson boon, The Kensei. Grab your copy here. "The ebook revolution means that I have the freedom to write whatever I want and get it out there as soon as it’s ready for mass consumption. No longer do I have to slave over a proposal and hope that an editor in New York understands the scope of the project, gets excited, can then pitch it to a room full of supposed experts, gets the green light to acquire it, makes a decent offer (lol), and then tells me the book will be out in about a year. Now, if I have an idea I think is cool, I can just write the thing and put it out. If it flops, no biggie. If it’s a hit – all the better. But the amount of time and number of hoops to jump through for me to reach my readers has now been drastically winnowed." Jon F. Merz, in a guest post over at Joe Konrath's blog. Because I have a wife who supports this crazy goal I have of becoming a writer, I got to spend the weekend at the DFW Writers Conference. I think of this thing as our little hometown convention. A gathering of local writers. That's why it was always a shock when I saw people from out of state there. Heck, even out of town surprised me. There was a woman there from North Carolina. I ate lunch on Sunday across from a woman who came down here from Independence, Missouri. Even a guy came from California. I learned some things. I met some people. Made some connections. Picked some brains. I won't bore you with everything I took away from the conference here. I plan on doing that over the next few weeks with posts recapping some of the sessions I sat in on. Just wanted to tell everyone that I went and say thanks to Gina for OKing the expense to go. It's nice to have someone in my corner believing that this writing dream ain't so crazy.